The US solar industry has experienced a boom in installations as costs fall and revenue support continues to take effect. Deutsche Bank analysts predict that the accelerating level of installations experienced globally in 2013 will continue well into 2014 and beyond. But not everyone agrees that the portents are so good for the USA’s domestic market. 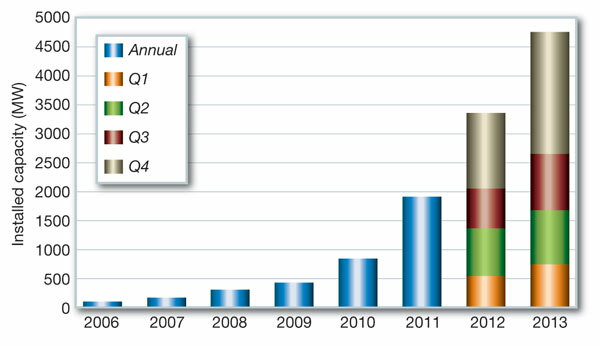 The year 2013 was a record breaker for the USA's solar industry, which is now completely dominated by the PV market. 4751 MW of new photovoltaic (PV) capacity was installed, representing a 41% increase in deployment over installation levels in 2012. Solar accounted for 29% of all new electricity generation capacity added in 2013, up dramatically from 10% in 2012, which made solar the second largest source of new capacity behind natural gas. The record year was driven in part by historical growth in the fourth quarter, as 2106 MW came online in Q4 alone. There is now over 13 000 MW of cumulative solar electric capacity operating in the USA. There were 140 000 new solar installations in the USA during 2013, bringing the total to over 445 000 systems now operating. The utility market led the way again with 2847 MW of PV and 410 MW of concentrating solar power (CSP) installed in the year. These are the main conclusions of data (Figures 1-3) collected by the Solar Energy Industry Association in conjunction with GTM Research and published in *U.S. Solar Market Insight: 2013 Year in Review. These are the report's highlights. There is now a total of 12.1 GW of PV and 918 MW of CSP operating in the USA. Solar's 29% of all new electricity generation capacity in 2013 was up from 10% in 2012, making solar the second-largest source of new capacity behind natural gas. 410 MW of concentrating solar (CSP) was installed in the USA in 2013, increasing total CSP capacity in the country by more than 80%. A number of new financing mechanisms for solar emerged in 2013. NRG Energy went public with its YieldCo vehicle, generating a tradable, dividend-producing security that contains both utility-scale and rooftop solar projects, as well as fossil fuel assets. SolarCity successfully launched the first distributed solar securitisation, worth $54 million. Opportunities for consumers to invest in solar via crowd-funding or community solar gained new prominence. PV module prices increased slightly in 2013, the first annual price increase since 2008. However, prices fell substantially for other components such as inverters (which decreased by 15% to 18%) and racking systems (19% to 24%). In addition, a range of other factors including downstream innovations drove down overall system prices throughout the year in all market segments. By the end of the year, system prices had fallen 9% in the residential market, 16% in the non-residential market and 14% in the utility market. On 31 December 2013, SolarWorld Industries filed a new antidumping/countervailing duty petition before the US International Trade Commission. This petition seeks to prevent Chinese module manufacturers from using Taiwanese crystalline PV cells to avoid paying the import tariffs on modules with Chinese cells that were imposed after SolarWorld's initial petition, filed in October 2011. Although the outcome of this case remains uncertain, it is likely to reshape the US solar market in some fashion. California alone installed more than half of all solar in the USA in 2013. In fact, the state installed more solar in 2013 than the entire country did in 2011. California led the pack in each market segment and saw a doubling of installations in both the residential and utility segments. Looking to 2014, California shows no signs of slowing down, particularly in the distributed generation market. As the solar industry grows, so does its impact on the economy. According to The Solar Foundation's Solar Job Census 2013, there are nearly 143 000 solar workers in the USA, a 20% increase over 2012. These workers are employed at 6100 businesses operating at over 7800 locations in every state. In 2013, solar electric installations were valued at $13.7 billion, compared to $11.5 billion in 2012 and $8.6 billion in 2011. For 2014, the SEIA forecast shows 26% overall growth over 2013's record installation totals in the US solar market to nearly 6 GW. This dwarfs the contribution of concentrating solar power (CSP) added, itself a record, and 2014 will be a record year for CSP too, as 840 MW are expected to be commissioned by year-end. SEIA expects growth in all three segments, residential, non-residential and utility, although at varying magnitudes. While the 5 MWac Kalaeloa Solar One project was the only concentrating solar power (CSP) project to come online in the first three quarters of 2013, in Q4 the first wave of mega-scale projects came into operation, starting with Abengoa's 280 MWac Solana Generating Station and the first 125 MWac phase of NextEra's Genesis solar project. While BrightSource Energy's Ivanpah project dominated market news throughout 2013, it officially achieved commercial operation during Q1 2014. The next notable project slated for completion is SolarReserve's 110 MWac Crescent Dunes, which entered its commissioning phase in February. The Los Angeles Times on 14 January published an article that analysed progress in recent solar applications and identified a slowdown in actual development, suggesting a decline in the years to come in the key area of utility scale projects rather than the boom being predicted elsewhere. A number of companies has gone out of business, it says, and major projects have been cancelled for lack of financing. Of the 365 federal solar applications since 2009, only 20 plants are on track to be built. Only three large-scale solar facilities have gone online, two in California and one in Nevada. In October the first auction of public land for solar developers, 3700 acres in Colorado's San Luis Valley, failed to draw a single bid. Several factors are identified. The tight economy has made financing difficult to obtain, and the federal government has not said whether it will continue to offer tax credits beyond 2016 of the size that brought a rush of interest in large-scale solar five years ago. "Nobody's going to break ground on any big new solar projects right now - utilities want to see how farms coming online this year fit into the grid"
“I would say we are in an assessment period," commented Amit Ronen, director of the George Washington University Solar Institute. "Nobody's going to break ground on any big new solar projects right now - utilities want to see how farms coming online this year fit into the grid, and developers are waiting for more certainty about state policies and federal tax credits." Another, but unexpected issue, is the difficulty solar developers are having negotiating agreements to sell their power to large utilities. The agreements reached to date guarantee solar providers higher rates than utilities pay for power from traditional energy sources. Utilities had been willing to pay more because many states, including California, require them to derive a significant percentage of their power from renewable energy sources. But now utilities in many states are on track to meet those requirements, giving them less incentive to buy higher-priced solar energy. And the steep decline in natural gas prices has cut the cost of power from gas-fired generators. In California, utilities are saying they have enough projects under contract to meet the state's 33% standard for power from renewable sources, said Jerry R. Bloom, chairman of the energy practice at Winstong and Strawn, a Los Angeles-based firm that arranges financing for large renewable energy projects. The centre of activity in the solar business is undoubtedly California, where the industry has suffered projects that have been put on hold (Blythe Solar), withdrawn (Rio Mesa), suspended (Hidden Hills) or failed outright (Carrizo, Calico, Beacon Solar and Imperial Valley Solar). Some moribund projects have been the victim of the delays and cumbersome requirements involved with siting huge power plants on public lands and dealing with environmental and cultural sensitivities. However the industry itself sees any progress as positive, and is optimistic that projects that have signed power purchase agreements will in fact be built. SEIA's own figures suggest that near future growth will be concentrated not on the utility market but on residential take up. They show 2847 utility MW installed in 2013, representing 58% growth over 2012, with utility PV installations in 2013 alone accounting for about one-quarter of all cumulative PV capacity in the US. Of this total, a record-breaking 1.4 GW came on-line in Q4 2013. But despite this huge growth in installations, project pipeline replenishment was in the red in Q4 for the first time in the segment's history, with installations outpacing new procurement as RPS-driven demand began to wane and with less than three years remaining in the 30% federal investment tax credit. The contracted pipeline of projects fell from 12.6 GW to 11.7 GW, of which 3.3 GW is currently in construction with expected completion in the next two to three years. "Deutsche Bank reported that most companies expect global PV installations to reach 45-50 GW in 2014"
A poll conducted by a Deutsche Bank research analyst (Vishal Shah) at October's Solar Power International event in Chicago gave early indications that most solar companies in attendance anticipated a rather bullish 2014 for the industry. The mood was reflected across the board, with Deutsche Bank reporting that most companies expect global PV installations to reach 45-50 GW in 2014. The general opinion was that while Europe would continue its period of consolidation, emerging markets would join the USA in creating numerous robust solar industries elsewhere, chiefly in South America and the Middle East. China and Japan would continue to enjoy strong growth, driven by Yingli Green and Trina Solar, who will "remain the picks in the Chinese solar sector," according to Shah. The prevailing feeling was that by end-2013 China would have installed between 8 and 9 GW in the year - up from a prior estimate of 5-6 GW. This increase can be partly attributed to a rush of solar installations in Western China, where the onset of 2014 marks a reduction in incentives from RMB 1.0/kWh to 90c/kWh. For 2014, China was forecast to install PV capacity somewhere in the region of 12-15 GW. In the event the more formal research of Deutsche Bank Markets Research bore out these instincts, forecasting a strong 2014 for solar in general, with diverse global factors coming together to improve market conditions and increase overall demand. It has raised its global solar demand forecast for 2014 and 2015 to 46 GW and 56 GW respectively. In a new report published in February, 2014 Outlook: Let the Second Gold Rush Begin, Deutsche Bank said 'upside demand surprises' from the US, Japanese and Chinese markets could continue in 2014. To quote the report - "We expect streamlined incentive programmes in China, additional subsidy cut signals in end 2014, and decreasing financing constraints to act as catalysts for upside. Similar to the '05-07 capacity rush, we expect another gold rush by downstream installers to add recurring MW ahead of policy changes over the next 2-3 years. Moreover, we expect grid and financing constraints to improve from 2014." According to the report, key catalysts and swing factors include Q1 seasonality - solar stocks are generally discounting weak Q1 seasonality as demand from Europe, the USA and China has been historically very weak at this time. However, demand in China is expected to remain relatively strong and also markets such as Japan, the UK and other international markets are likely to drive strong Q1 momentum. And the China and Japan demand outlook, which is expected to remain a major swing factor. The Deutsche Bank report records grid parity in more than 10 states in the USA - in other words, that it is competitive without additional state subsidies. Solar levelised cost of energy in these states ranges from 11-15 c/kWh and compares to retail electricity price of 11-37 c/kWh locally. These grid parity states currently have a cumulative installed capacity of ~6 GW (2012). However, considering the improved economics of solar in these markets along with other growth enablers such as solar leasing and availability of low cost financing, the bank expects installed capacity growth of ~600% over the next 4 years. There is also potential in other states. Assuming solar system prices decline from sub-$3/W currently to sub-$2.50/W over the next 12-18 months, solar LCOE in existing grid parity states could decrease further to 9-14 c/kWh driving further acceleration in solar shipments. At these system price levels, solar has the potential to reach grid parity in 12 additional states as LCOE approaches 11-14 c/kWh. "The bank believes that the broader acceptance of 'yieldco' type structures could lower solar financing costs "
The bank believes that the broader acceptance of 'yieldco' type structures could lower solar financing costs - solar LCOE could potentially decrease from 10-16 c/kWh to 8-14 c/kWh as a result of wider acceptance. ITC expiration could act as another catalyst. The form of federal investment tax credit (ITC), which is set to expire in 2016, will be greatly influential (Figures 5, 6). Without any ITC, solar LCOE increases from 10-16 c/kWh to 15-21c/kWh. In a 2017+, 10% ITC environment, solar would be at grid parity in ~36 states (vs ~47 states with 30% ITC), assuming system prices and financing costs decline although the economics for solar would not be as attractive. Consequently, the bank's analysis suggests a rush of new installations ahead of the 2016 ITC expiration. Deutsche Bank at least is backing its hunches. On 27 February SunEdison closed a non-recourse debt financing arrangement with the bank to fund four utility-scale PV plants in the UK. The four solar projects will have a cumulative capacity of 56 MW and are currently under construction in various parts of southern England. The portfolio was expected to be fully operational by the end of March 2014 and would mark SunEdison's first footprint in the UK's rapidly expanding solar market. By Leonard Sanford, deputy editor, ModernPowerSystems.